The Splendid Sampler™ free block of the month starts Sunday Feb 14, 2016, which is tomorrow! Jane and I are on pins and needles to start this, plus we’ve been awake for days on end getting it all set up, chatting at odd hours of the day and night since we live on opposite sides of the world!! Hello Australia……….. Hello United States! Over 80 quilting industry professionals have joined us to create the first ever world wide 100 block Quilt along. And YOU have joined us. We have over 17,000 quilters ready to sew. That is a lot of quilters! Have you tried to visualize 17,000 people? It kind of looks like this.. you can’t invite them all to your backyard. You might not even have that many in your entire town. It takes a village to make The Splendid Sampler™ fun and have everything run smooth. And you are part of it. We have lovely guidelines that we’d like you to keep in mind..
1- If you can’t find something – Maybe a link or information please look in the FAQ and Tutorials before you panic. Panic is not good, we make mistakes when we panic. Let’s try and avoid it. 2- Embrace learning. — We imagine that during this year long journey there will be something you have not tried before. Or maybe you did try a technique and didn’t like it. Why not try again? Your skills may be different now, and a different way of doing it may be all it takes for it to click! (read my thoughts on this). There are no quilt police, and the same result can be achieved in many ways. 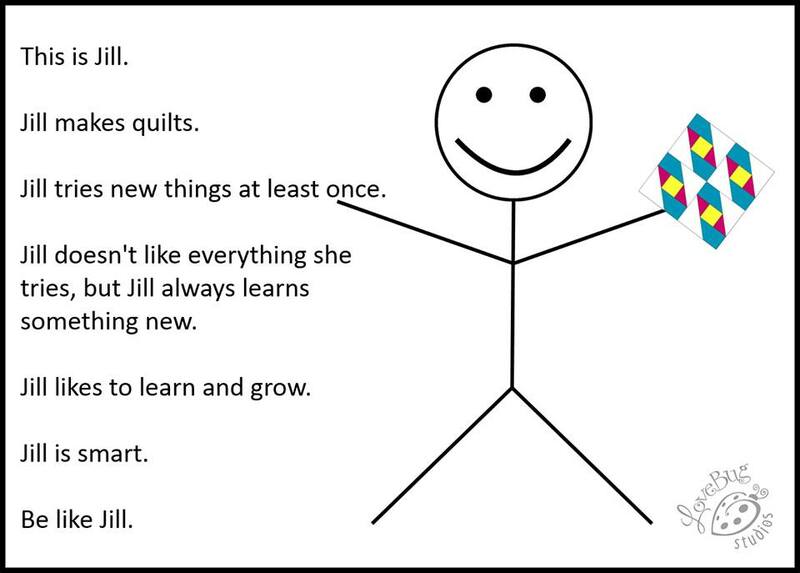 This is your quilt, make it your way and it will be super fun!! 3- This is not a race.— It’s important to remember this… ‘This is not a race, it’s a journey’. Many of The Splendid Sampler™ blocks will take you more than a few minutes to make. You might find that making a test block or a test section of a block will help you get familiar with a new technique. A few minutes with some scrap fabrics and a test block section may be a valuable investment when you make ‘the real thing.’ Take your time. We are going to be together until we all finish! 4-Oh Dear I missed a block (or maybe blocks!!) … I’m BEHIND! 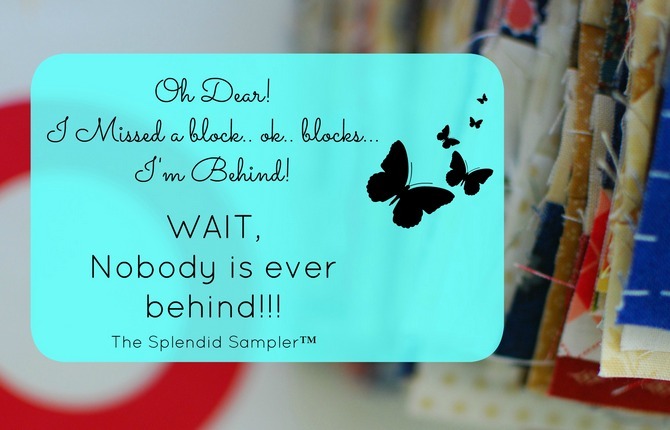 — The BEST PART of being in The Splendid Sampler™ is that you are NEVER behind. We are Serious about this. Life happens, things take time, so if you have not worked on several blocks , we have a simple plan for you. Pick up at the next block released and go forward. At some point, go back to do the previous blocks. Work at a pace that is comfortable for you. Simple right? Pinkie Swear on this one, you are going to hear it often. What time on the Sunday or Thursday – In order to keep from stressing on time, we are not giving the time of a post.. that is too crazy stressful for Jane and me, and you don’t want us stressed do you? Read the Directions FIRST – Seems simple, but often we think we know how it’s going to work, and then .. well it works different! But we’ve gone into auto-pilot and cut… sewn .. and it’s not right. When you read the directions first, take your time, you’ll make less mistakes… ask us how we know! Ways of Doing Things – if you have a preferred method for making half-square triangles, or a preferred method for doing appliqué (i.e. needle turn vs. fusible), go ahead and do it the way you like to do it. Making the block the way you love making it. After all, this is YOUR quilt, and it’s YOUR choice how to complete each block using your favorite method. There are many ways to accomplish the same end result! What if I think there is an error in the Pattern – First double check your work. Since the pattern has been edited and made already by many people, be sure you really feel there is an error. If you still think there is, at the website and on the TOP navigation bar is a CONTACT button. Send us a note with block name and exactly what you think is wrong. 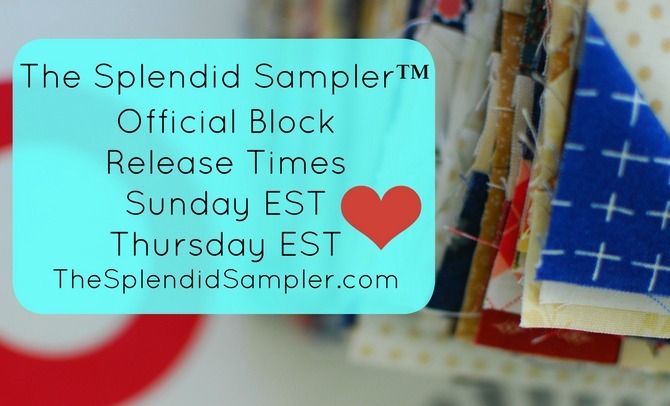 We have done edits, people have made the block from the pattern, but there still could be a error or wording issue in our free patterns. Please be kind, do not go nuts in the classroom. It’s one 6″ block, we’ll get it fixed if there is an error. New to Pattern reading? We have a tutorial here. We know that many people have learned to quilt by looking at photo tutorials or by watching a video. You might not have learned the parts of a pattern. This is a great project to learn with. Please start it in a positive way – Hello I have a question! Rather than starting with ‘I am mad, frustrated, unhappy, sewed for all my life and ….. .xyz…’ When someone asks calmly for help, don’t you immediately want to help that person? And when someone is ranting or whining?.. let’s all stay calm, breath… if you have a question, ask, people will want to help you…. am I right? Be Specific – Tell us the block name when you ask, with 100 blocks people need to know WHICH block it is. Explain what the problem is – My block is 1″ too small, I do not understand step 2 of the pattern on page 1 where it says xyz…. Show us the Issue with a photo — Take a photo of the block, your ruler placement, the unit in question. Put it on your cutting mat, put a ruler next to it. Tell everyone what block you are working on and we can help so much faster. 7- And speaking of Help — You are a village and you can teach each other. If you know the answer, share it. Be part of our community. 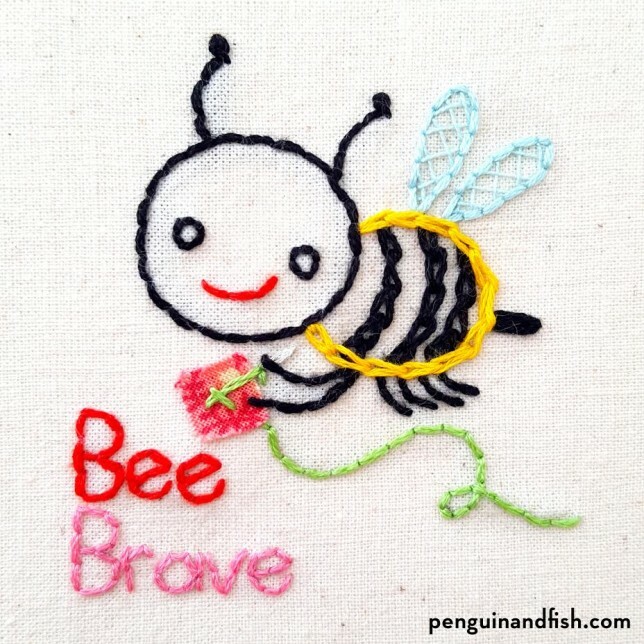 8- Make new friends, Try new Things, Be Brave! Great!- Leave comments if you love someone’s work, tell them you do! Ask them how they did something you are curious about. We are ALL real people behind that thumbnail photo. Think of them sitting next to you. Leaving positive notes builds friendships. NOT so Great– Resist the urge to tell someone ‘they did it wrong’. There is no wrong. Only different ways to accomplish a project. So if it’s not what you would do, just KEEP SCROLLING. 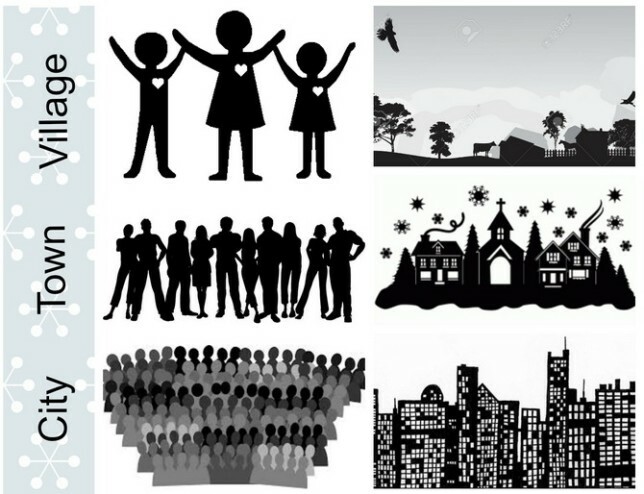 9- Many New Cultures – We are an international community. 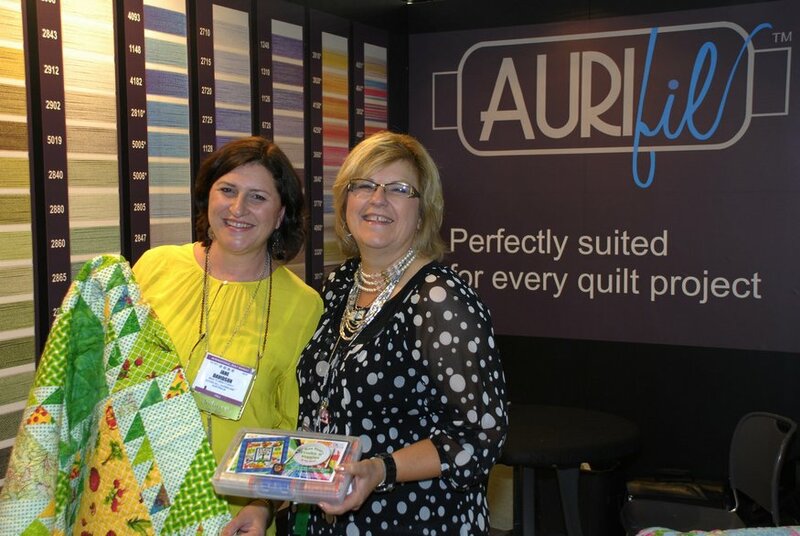 First let Jane and me say, that getting to know quilters from around the world is incredibly exciting! 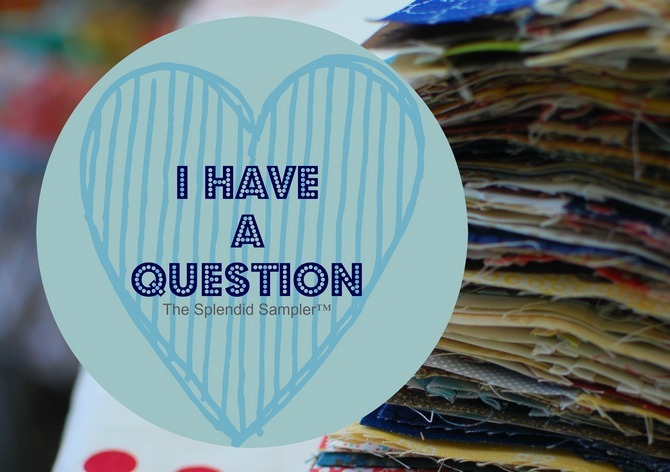 Have you chatted with a quilter from Brazil before? South Africa? How about Germany or Romania? Please remember that most people will write in their native language. Facebook does do translations but if it doesn’t… copy and paste into Google Translate, you can write back in their language by going reverse.. so easy! Jane and I have spent many many many hours getting ready for this. I feel like we have run five full length marathons, we have not slept for weeks and we both drank a lake full of coffee to keep going. More than 80 other designers and Quilting industry folks have joined us to make this happen and to help us along the way. We hope you love this journey. We hope you invite friends to sew with us. And we hope you will breath, take your time, be kind, do not get crazy over things, and most of all we sincerely hope you sew your blocks with love and new found friendship. 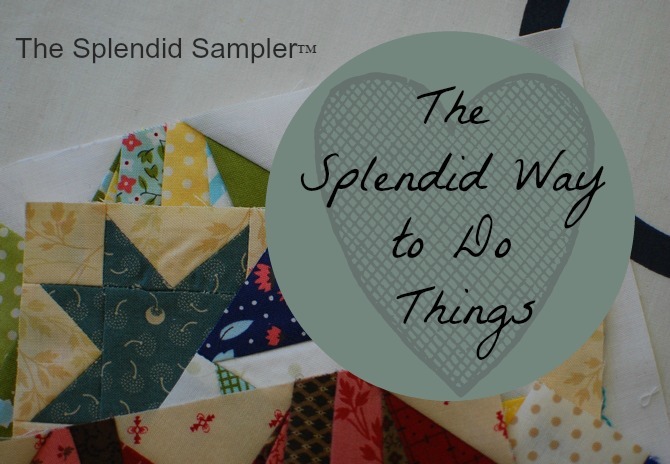 You know, in the end, The Splendid Sampler™ is not about the quilt. It’s not even about any one block or any one quilter. Each block has its own story reminding us that there’s a real living, breathing human being behind every single design. Each one of us will add our own interpretation to that block with the fabrics that we choose, with the thoughts going through our minds as we create, and the skills that we bring to the project, making this a truly splendid journey. . . .
A journey of a thousand miles begins with a single step. (Chinese proverb) …. Or in our case, a single stitch! Sign up to get a notice when Jane does a new article and sign up for her Facebook Page!